My town is currently experiencing a heat wave, with temperatures hitting 90 every day this week. (In our little arctic suburb, this is a big deal.) I don't complain about the weather, but I will admit that it has sapped my creativity the past few days! I come home from work and crash; it's too warm to get up and do things until 8pm when the sun is going down. So rather than paint my nails last night, I waited and did them this morning. Story time! 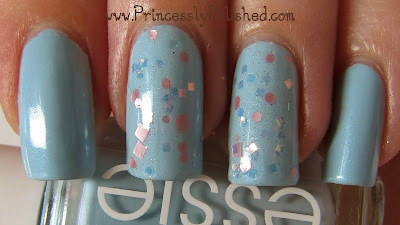 Essie Sweet Talker is from their 2010 foray into retail sales. (In fact, it was an exclusive color, so all bottles of Sweet Talker should have a white printed "Essie" on the side, and a sticker with the name on top.) This color landed on my wishlist right away when I was first getting into polish, and I managed to track down a bottle (along with a bunch of other colors) on eBay. Then it was put away in a box, where it sat, and sat... and sat. I have a few Essie polishes I love, but I learned that more often than not I don't like the brand's formula, so I allowed myself to be distracted by other polishes for quite awhile. I was afraid Sweet Talker would be sheer, pool-y and need at least 3 coats. Today I'm happy to say that it exceeded my expectations. I used 2 careful coats, giving it time to dry in between. It is actually a bit on the thick side - I'll add a bit of polish thinner to my bottle. The aqua microshimmer in the bottle isn't as visible on the nail, but it doesn't disappear, either. And I love the pastel blue. I want a straight-up creme in exactly this color! I♥NP Angel Burp is a really pretty glitter in a shimmery clear base. On my thumb I'm wearing 2 coats, the other nails had 1 coat. The formula was a bit thick and I did get some teeny bubbles when I was squishing glitter around with my brush - these really only show in pictures. I topped it off with 1 coat of Poshe and don't have any texture from the glitters; they are thin and lay very flat! And what pretty glitters they are. Satin pink squares and hexes mixed with iridescent squares! (I'll definitely be combining this with Nyx Girls Dreamy Glitter sometime for a manicure filled with pink pastel shape goodness.) The iridescent squares shine with a whole rainbow of soft hues, not just the peachy-pink that you see in the bottle! If you don't already have this glitter and you love it as much as I do, be quick! This is another discontinued I Love Nail Polish shade, but I saw it is still available at http://www.ilnp.com/ as of today! Pretty combo! Reminds me of revlon whimsical a little bit!